Choose accessories that coordinate with the fabric, colors, and textures of your clothing. Find accessories for women's clothes that will work with more than one outfit to stretch your budget. For instance, look for neutral-colored items such as shawls, hats, scarves, handbags, gloves, and jewelry so you can wear these with a number of outfits. Colors that usually go great with a variety of patterns include plain tan, white, blue, green, red, and black. With basic women‚s accessories, try to follow the fashion trends. Look through fashion magazines to see what is trendy for the season and change your accessories as needed. You can great ideas on how to combine colors, fabrics, and patterns for a great outfit. Keep in mind that many fashion magazines go to the extreme when it comes to trendy women‚s clothing and accessories. There are some women‚s garments displayed in magazines that you would never dare to wear. So, choose those that you feel will look great on you for the occasion, and leave the others to the fashion models! You might also be able to use your jewelry, shoes, or belts with different ensembles after you get some new ideas. Many clothing items for women can be interchanged with other pieces to create multiple outfits. So you might wear one shirt with two different skirts or one skirt with several different shirts. Then switch around your accessories to match. 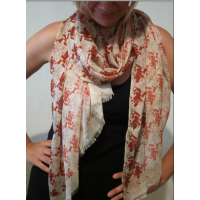 And don't forget, there are plenty of ways to accessorize fine silk shawls and Italian scarves. Make sure your jewelry complements your clothing's neckline. If you were wearing an open v-neck blouse or sweater, then a lovely necklace would complete it. If you have a detailed neckline with fancy trim or stitching, try wearing a nice bracelet and eye-catching earrings. If you have a complex necklace and bracelet set, wear it with something simple. A long necklace will draw the focus away from your neck and face if that's your goal. Avoid wearing earrings that bring all the attention to your ears; they should complete your outfit but not overpower it. A fancy or detailed handbag should be used with a simple, single colored outfit. Be sure to wear a variety of accessories; don't wear the same necklace with every outfit or the same scarf with every suit. Mix and match your accessories so your outfits will always be appealing and interesting. Women's fashion accessories can be fun to pick out and wear once you know how to shop. If you want a new look or need help getting started, pick up some women's magazines to discover what looks good with what and find the styles that you like. Then go through your closet and put together a new wardrobe with dazzling women's accessories to match. Use these accessory ideas to look your best every day! What are your best fall fashion accessory tips? Please, share them in the comments section, below. They may be featured in an upcoming post here on my blog, with proper credit, of course.